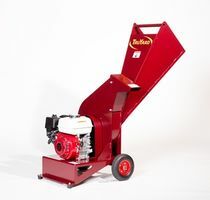 This is a high speed discharge chipper powered by an ever reliable Honda GX200 engine. This engine is known for its reliability, longevity and easy start system so you know your buying a product built to last. Branches are easily fed into the large chute chipper chute and the self feeding action pulls the green waste through with ease. The larger opening removes the need to trim the branches prior to chipping. Can chip branches up to 70mm. The proof is in the pudding, bring in a bag of your garden waste if you are serious about wanting one and we will fire it up to see if your satisfied with the job!! Dual hardened high carbon steel chipper blades. Dual hardened steel chipper blades. High quality product meaning that its edge is kept sharper for longer.